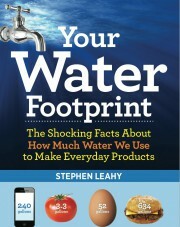 Stephen Leahy, author of Your Water Footprint, will be honored at a private awards ceremony on June 19 at the Grolier Club in Manhattan. This entry was posted in energy, environment, food, Water, water footprint, water scarcity, water use and tagged awards, beef, book award by Stephen. Bookmark the permalink.